Published: Oct. 14, 2015 at 05:03 p.m. Updated: Oct. 14, 2015 at 05:24 p.m. The top-five ball carriers all clocked at least 21 mph on their way to the end zone in Week 5. 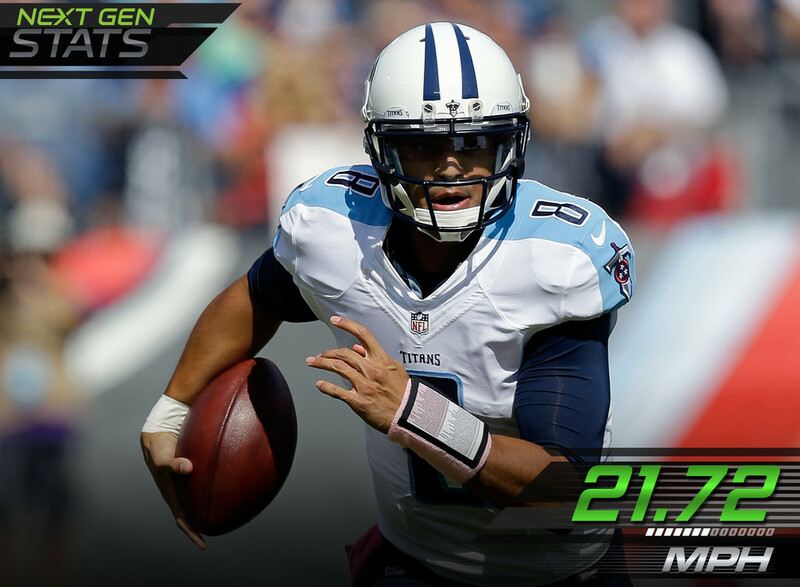 See who else dominated in this week's Next Gen stats. Rookie quarterback Marcus Mariota not only recorded three of the top-five max speeds by a QB, but two of the top five by any ball carrier, reaching speeds of 21.72 mph and 21.56 mph. After an exciting touchdown-filled Week 4, Devonta Freeman dominated Week 5 by running the ball the longest distance of 794 yards. He rose above RB DeMarco Murray, who had the second-longest run at 644 yards and RB Justin Forsett, who had the third-longest run at 605 yards. Julio Jones is getting the veteran rest he needs to avoid injury. In addition to sitting out practices midweek, Jones is tied for 42nd among wide receivers with an average of 50 plays per game. He was in for a season-high 71 plays this week. His previous high was 57 against the Giants in Week 2. Russell Wilson spent another week dealing with pressure. He covered the second-most distance per play among quarterbacks at 14.33 yards, behind only Jameis Winston at 18.86 yards. Todd Gurley nearly hit the speed leaderboard again this week with his second run over 50 yards in two weeks. On his 55-yarder in the fourth quarter, Gurley hit 20.82 mph while the 10th-fastest speed was 21.07. On the game-winning throw to Matt Forte, Marquess Wilson set a pick on Husain Abdullah, allowing Forte a brief moment with no more than 1.6 yards of separation. That number shrunk to 1.38 when the ball arrived only in a spot Forte could elevate to get it. The Cardinals' secondary faced a total of 70 pass attempts from Matthew Stafford and Dan Orlovsky and Arizona's DBs all covered at least 1,929 yards. They were the top two for cornerbacks and free safety, and second and fourth at strong safety this week. Odell Beckham Jr. temporarily left the game in the second half with a hamstring injury but returned to draw a pass interference penalty to set up the final touchdown. Beckham didn't seem too hampered by the hamstring, as he reached the same top speed (16.8 mph) on that penalty as he did on a 31-yard catch-and-run in the second quarter. Game flow finally gave Carlos Hyde the opportunity to stay on the field and get touches. He was in on a season-high 58 plays after averaging nearly 36 the last three weeks. He also got 22 touches after seeing a combined 42 in the last three weeks. The running back watch in San Diego took a turn in Melvin Gordon's favor. He got 22 total touches and nine pass targets compared to nine touches for Danny Woodhead and seven pass targets. Gordon was on the field for 43 of 69 plays (62%) compared to just 24 (35%) for Woodhead. Woodhead has been resigned almost exclusively to a passing-downs back, seeing the field on eight third downs compared to just two for Gordon.